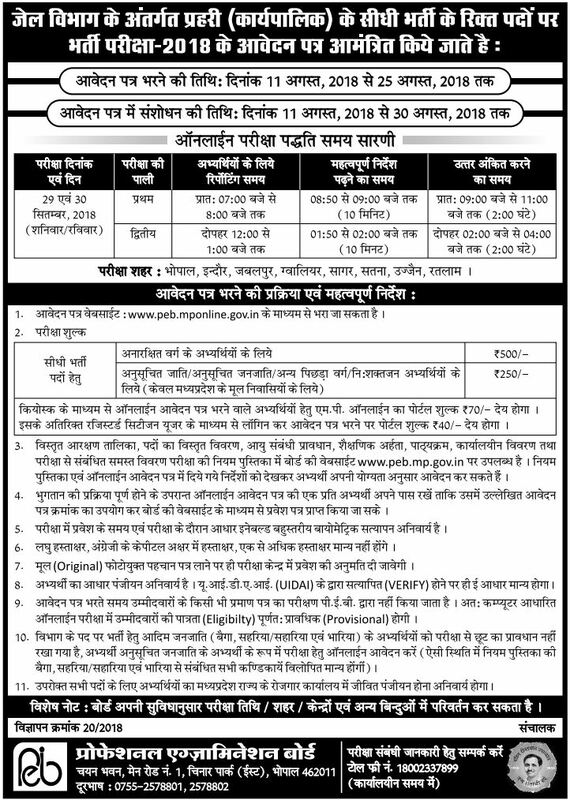 Government job recruitment department Madhya Pradesh Professional Examination Board has annouced various 2019 job openings describing below. Every year Madhya Pradesh Professional Examination Board department opens various jobs positions and invites applications from eligible Indian Citizens. Candidates full-filling required eligibility criteria can apply for following Available on 11-August job positions before job application end date 25-08-2018. Latest 2019 Madhya Pradesh Professional Examination Board jobs recruitment started digitalization mode with online applicaton submission for all Government Jobs Recruitments and online fee payment. Subscribe AltUsIndia for sending you free latest Government Jobs notificaton for Madhya Pradesh Professional Examination Board department. Jail Prahari Available on 11-August Candidates must have passed 10+2 Intermediate Examination from a recognized Board. Why AltUsIndia For Checking Madhya Pradesh Professional Examination Board Job Details ? All eligible candidates are requested to apply online from official website provided link provided on AltUsIndia. Madhya Pradesh Professional Examination Board has invited online applications for Available on 11-August vacancies. Eligible candidates are required to check complete recruitment edibility conditions and go through given instructions completely. Click here to check complete Madhya Pradesh Professional Examination Board instructions for apply online. Please ignore apply online details & instructions if mode of application submission is offline or by post. Visit Madhya Pradesh Professional Examination Board official website. Click here for For Madhya Pradesh Professional Examination Board GK Preparation. Test your General Knowledge prepration by taking online mock test. Check out "All India GK", "State Wise GK" for random question data based specially prepared for competition exams. Keep visting for latest information and study material on AltUsIndia.com. We are open for your suggestions, so do not hesitate to share your comments with us to help you better. Admit card is very important document after application submission. AltUsIndia take care of each candidate and provide admit card information well ahead, so that no candidate miss examination centre details. Madhya Pradesh Professional Examination Board will send informaton to each candidate who has submitted online applicaton with valid and complete details. Donload Admit card notification will be sent on Email address or mobile number provided by the candidate during apply online. Please check "Madhya Pradesh Professional Examination Board Admit Card" section for donwnloading Madhya Pradesh Professional Examination Boardrecruitment exam Admit Card. Note: In case you face any difficulty for searching/downloading Admit Card on AltUsIndia, requested to use search option to filter results specific to Madhya Pradesh Professional Examination Board. Government recruitment official departments website, candidate has to provide Application ID (Mentioned on application form) / Date Of Birth / Email ID informaton as input secure data to download Admit Card. Candidates registered with us will surely notified on Admit cared availability on registered email address. Answer sheet, Cut-Off marks and result details are provided under "Madhya Pradesh Professional Examination Board Exam Results" section of AltUsIndia top most navigation. Our team keeps updating latest recruitment exam results information or references. Candidates facing difficulties for finding specific exam results suggested to use search option on AltUsIndia and filter recruitment examination result details. Candidates registered with us will surely notified on registered email address when the result information is declared by the Madhya Pradesh Professional Examination Board official recruitment authorities. There were total Available on 11-August vacancies under this recruitment examination, AltUsIndia wish you all the best for your career and we are with you to have bright future ahead. Keep visiting our "Madhya Pradesh Professional Examination Board Recruitment News" section for lasted news updates and important knowledgible information. Eligible candidates will be called/ informed with proper channel for next roud of selection procedure. Candidates who will score with required marks in each roud of selection procedure can be considered for joining by the recruitment authorities. Make sure keep yourself updated with time to time Madhya Pradesh Professional Examination Board official news updates or AltUsIndia.